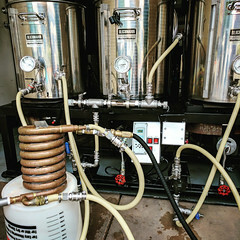 Coupon Description: MoreBeer.com currently has a coupon code that allows you to save on a new 7 gallon stainless steel fermenter for homebrewing or home wine making. 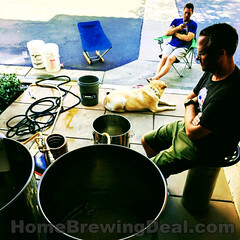 Thank you for checking out the Homebrewing Deal Blog! Save Big on MoreBeer Stainless Steel Conical Fermenters! Coupon Description: MoreBeer.com currently has a promo code where you save $295 on select stainless steel homebrewing conincal beer fermenters. I am not to sure how long this sale will last, so pick one of these up at a big discount while you can! They have 3 different sizes available, 7.5 Gallon, 14 Gallon and 27 Gallon Stainless Steel Conical Fermenters. Coupon Description: MoreWineMaking.com currently has a promo code on a 58 Gallon Stainless Steel Variable Volume Tank for Home Wine Making. This coupon code is for a Speidel 220L stainless steel variable volume tank . These Variable Volume Tanks from Speidel are manufactured in Germany from high quality stainless steel for the wine industry and home winemakers. The tank body is build out of food grade 304 stainless steel, while the floating lid is made from 316 stainless steel. This variable volume wine making tank also has an inflatable bladder that pumps up to seal the wine off at any volume level. These stainless steel winemaking tanks can be used for primary fermentation as well as aging. These tanks arrive to you complete and ready to use out of the box after minor assembly. The tanks are fitted with 1/2 inch threaded ports to fit the included stainless steel ball valve and stainless steel plug. Coupon Description: MoreBeer.com currently has a promo code for a 6 gallon PET plastic carboy, perfect for either homebrewing or home winemaking fermentations. This coupon code is for a PET plastic carboy. These plastic carboys are made from PET plastic, which is the same type of plastic used in soda bottles. PET plastic is grate because it is taste and odor free and is far more resistant to oxygen than regular plastic. PET plastic carboys are also much safer than glass carboys as they are lighter, resistant to breaking and will not shatter potentially causing severe injury. Stainless Steel Brew Bucket Sale at MoreBeer! 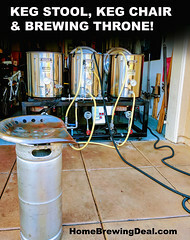 Coupon Description: MoreBeer.com currently has a sale going on where you can save money when you purchase one of their stainless steel homebrewing fermenter brew buckets! This coupon code is for a stainless steel homebrewing brew bucket fermenter. You will enjoy many of the benefits of a stainless conical fermenter but at a fraction of the cost and you are going to love how easy it is to use! This stainless steel fermenter is made from food grade polished 304 Stainless Steel. 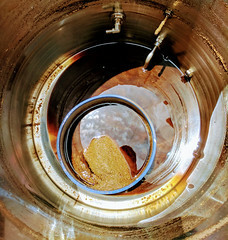 This Brew Bucket fermenter is a great home brewery upgrade. Coupon Description: MoreBeer.com currently has a deal of the day going on where you can save some money when you purchase a large sized home beer brewing scale. Coupon Description: MoreBeer has a deal of the day going on where you can save some money when you purchase a Sterile Siphon Stainless Steel Racking Cane. This coupon code is for a MoreBeer sterile siphon stainless steel racking cane. This racking cane will allow you to transfer your wort or wine from a carboy or fermenter while greatly diminishing the risk of contaminating it. This method superior to the numerous other methods of starting a siphon as there is no sucking the end of the tube, no plungers with faulty gaskets, no shaking, no filling up the tube with unsterilized water, no contamination, no disturbing the sediment, and no nothing to break. Coupon Description: MoreBeer has a deal of the day going on where you can save some money when you purchase a Speidel Plastic Home Brewing Fermenter. Includes a spigot and over sized airlock.